This natural-sized, graphic model shows the anatomical structures of a male groin with an indirect inguinal hernia, opened in layers. 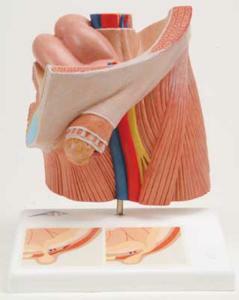 Two diagrammatic illustrations on the base allow for a comparison of direct and indirect hernia. A useful model to help inform patients before undergoing surgical interventions. Mounted on base.